Each year, through my private practice and my consulting firm, I participate and raise pledges for the American Foundation for Suicide Prevention, through their local Community Walk. AFSP is one of the good ones, earning a four star rating on Charity Navigator. 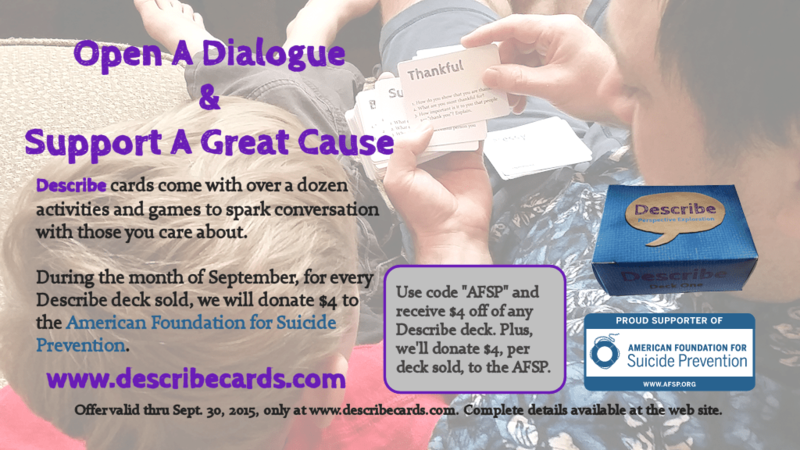 This year, I am excited to announce that, during the month of September, I will also be donating $4 to AFSP for every Describe deck sold! Buy Describe Here! If you prefer to pledge directly toward the walk, you can do so here. Offer valid thru 11:59 Eastern Time, Sept. 30, 2015, only at www.describecards.com.